The Academy Awards are arguably the awards season’s biggest event. As such, the actresses and their stylists bring out their best bling at the Oscars. Here, we’ve put together a gallery of the some of the best jewellery ever worn on the Oscars red carpet. These may not all be among the most expensive jewellery worn to the event, but these are the pieces that were bold, iconic and memorable. In 1940, Vivien Leigh wore a large emerald-cut gemstone pendant necklace and multi-gemstone bracelet to the Academy Awards. 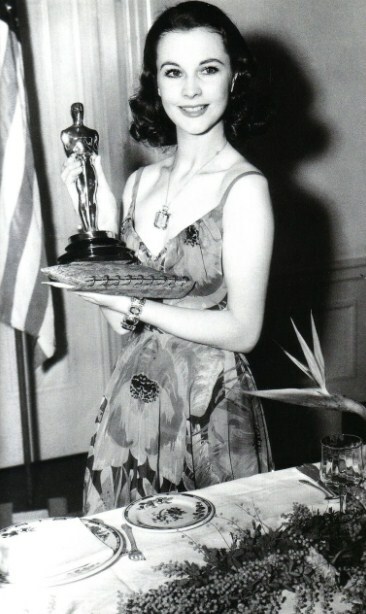 She won Best Actress for her role in Gone With The Wind. 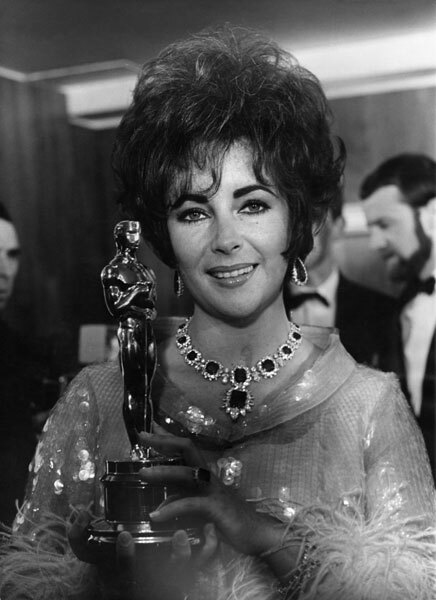 In 1967, Elizabeth Taylor won her second Best Actress Oscar to which she wore her dazzling Bulgari emerald suite of jewels, gifted to her by her husband Richard Burton. In 1970, Elizabeth Taylor wore a dress with a plunging neckline to showcase the 69-carat pear-shaped diamond that her husband Richard Burton purchased for her, originally as a ring, from Cartier. After their divorce, the piece was auctioned and later it helped build a hospital in Botswana. 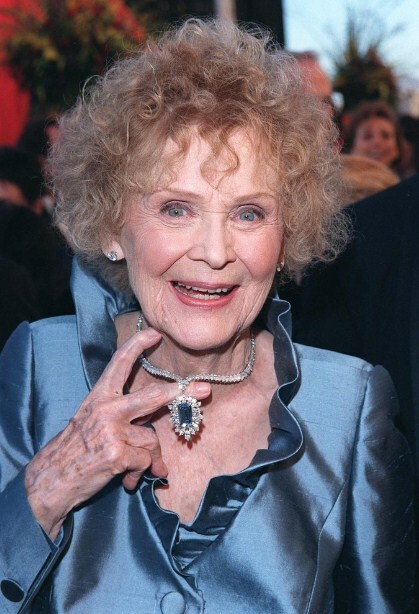 In 1998, Gloria Stuart, the woman who narrated the 'Titanic', had the honour of wearing the replica of the Heart of the Ocean necklace portrayed in the movie. Valued at $20 million, it was a brilliant sapphire and diamond necklace by Harry Winston. In 1999, Gwyneth Paltrow looked timelessly elegant in her pink princess gown by Ralph Lauren and Harry Winston jewels. After winning the Oscar for Best Actress for her role in ‘Shakespeare in Love,’ her parents purchased the 40-carat princess necklace for her as a gift. Harry Winston supposedly threw in the earrings at no charge. In 2004, Angelina Jolie brought some real bling to the red-carpet in the form of the 85-carat Athena necklace on loan from H. Stern. In 2006, in keeping with her effortless but refined look, Jennifer Aniston threw on a breathtaking diamond art deco necklace set with 137-carats of diamonds, from Bulgari’s archive collection. In 2008, Renee Zellweger sparkled in her silver Carolina Herrera gown and vintage Cartier jewels. The Private Collection Flower Diamond Brooch at her neckline, circa 1941, is considered to be priceless. A second brooch was set with over 45 carats of diamonds. A Cartier Art Deco Diamond Bracelet, set with nearly 400 diamonds sat pretty on her wrist. In 2008, Nicole Kidman’s custom Balenciaga gown was literally dripping with diamonds, more specifically with 1,399-carats of diamonds. The necklace was designed for her by L’Wren Scott and took 6200 hours to craft. In 2009, Angelina Jolie looking striking in her black Elie Saab couture gown which she wore with 115-carat Colombian emerald drop earrings and a 65-carat ring. 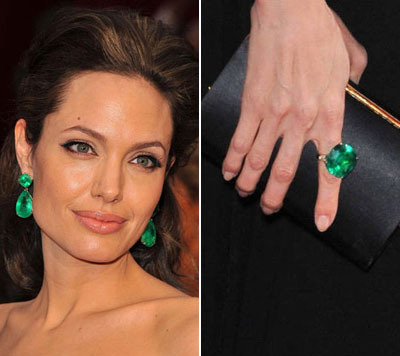 Her minimalist but stark use of emeralds started a trend for all things emerald. 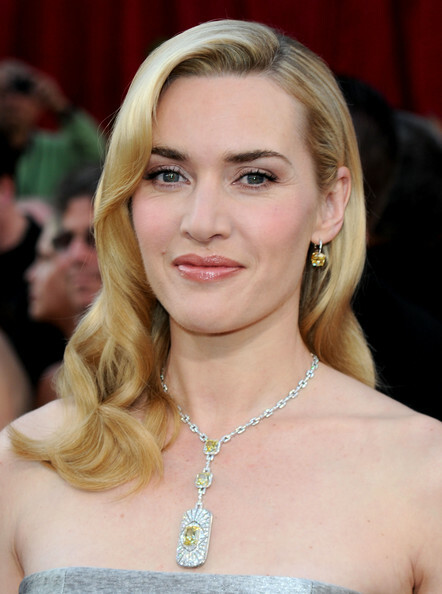 In 2010, Kate WInslet wore her Yves Saint Laurent dress with jewellery that Tiffany & Co. created exclusively for her. The bedazzling art deco-inspired yellow diamond necklace was paired with canary diamond earrings and three matching bracelets. In 2011, Anne Hathaway looked her part as the host of the evening when she wore her Valentino dress with a Tiffany Lucida Star diamond necklace, weighing a total of 94 carats and matching diamond earrings and ring. It was a classic look and she wore it well. In 2011, Amy Adams wore her blue L’Wren Scott gown with jewellery from Cartier. She wore a stunning platinum and diamond necklace and secret watch-bracelet, both with huge carved emeralds. For the 2013 Oscars, Jennifer Garner wore her Gucci gown with an elaborate 19th century necklace with 80-carats of diamonds set in blackened silver. Neil Lane selected the romantic piece from his personal vintage collection. In 2013, Anne Hathaway who won Best Supporting Actress for her performance in 'Les Miserables', styled her Prada dress with a floral Tiffany & Co. necklace, which she draped across her back. 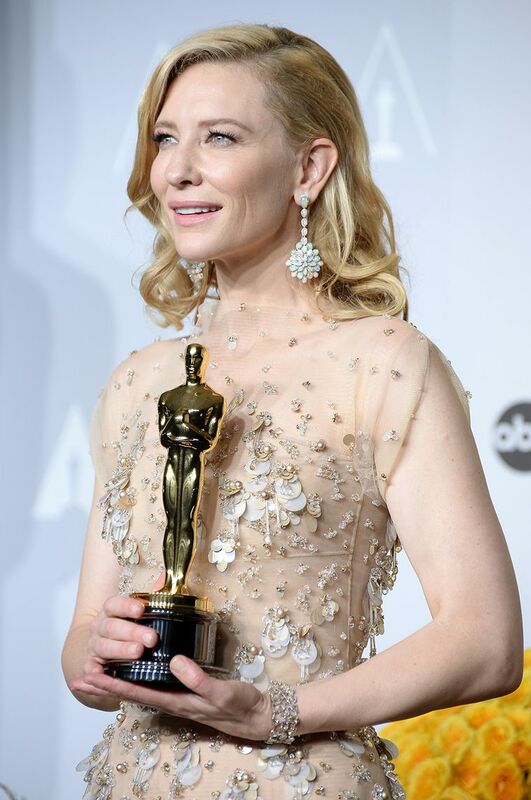 In 2014, Cate Blanchett paired her romantic gown with equally delicate jewellery by Chopard. The gorgeous earrings had 62-carats of opals set in white gold and the bracelet was made of brown diamonds. In 2014, Lupita Nyong'o looked like a princess in a powder blue Prada gown complemented perfectly by a dainty, diamond-and-gold headband by Fred Leighton. The gold and diamond crescent shaped earrings also by the same designer added the perfect amount of edginess. In 2014, Jennifer Lawrence wore her Dior dress with an art deco-style rock crystal and 100-carat diamond necklace draped down her back. She also wore two diamond rings, all by Neil Lane. In 2014, Charlize Theron’s diamond necklace by Harry Winston was one of the most expensive jewels to ever hit the Oscars red carpet. The diamond cluster pendant necklace featured a31-carat flawless emerald-cut diamond in the centre and stood out against her black Dior Haute Couture gown. In 2015, Margot Robbie wore a truly iconic piece of jewellery in the form of the Zip Antique Colombine necklace by Van Cleef & Arpels. Composed of 300 sapphires and studded with 150 diamonds, the piece can be converted into a bracelet. The original design was created in 1951 for the Duchess of Windsor. In 2016, Olivia Wilde made an unusual decision by pairing her plunging Valentino Haute Couture gown with a big choker and pearl-and-diamond earrings by Neil Lane. Going by how stunning she looked, the risk paid off! In 2016, Saoirse Ronan made the bold choice of wearing mismatched Chopard earrings at the Oscars. Made of pearls, emeralds, jadeites and diamonds, the earrings complemented her dress perfectly and made her stand out as the coolest fashionista.